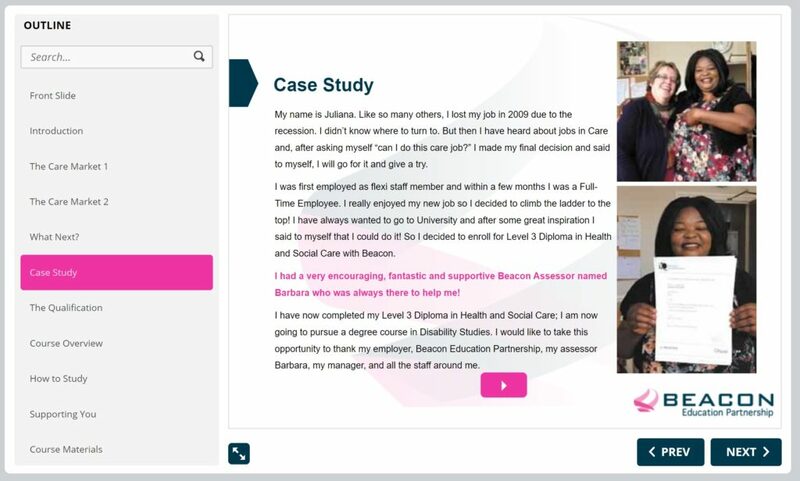 Our journey at Beacon Education, from a bricks and mortar education company delivering in person to learners all over the United Kingdom – to an online learning specialist really turned the tables on our staff – we went from being teachers to being the students. We had to figure out what makes a really good online learning experience and how that differs from our usual classroom delivery. Along the way we learnt some valuable tips for what to look for when searching for high quality online learning courses. Courses should lead to a REAL qualification. Unfortunately, most of the online courses out there today do not actually lead to a recognised qualification. Sure, you get a shiny certificate at the end, but when it comes time to showing an employer or trying to get into university, unless the qualification is regulated, it isn’t going to count for much. Not just a piece of paper. In the UK for example, you should look for courses that lead to a Office of Qualifications and Examinations Regulation (OFQUAL) regulated qualification only. In Australia, you should look for qualifications that are regulated by Tertiary Education Quality and Standards Agency and The Department of Education in the USA. Too many online courses do not provide adequate support for learners. Often, online courses are the be all and end all of the experience and there is no option for learners to ask questions, get help or learn more. You should look for online courses that also provide a range of support throughout the course rather than leaving you to push through alone. We have found that creating Whatsapp groups and video chats with our learners has really improved the learner experience, even if it’s just to let people know that they are not alone, and that they can do it! We all learn differently. Some of us love the text heavy page for those of us who are visual, we need videos, pictures and other multimedia. Too often we see online course that are linear and wordy, basically a textbook that has been put online. The use of videos, animation and photos is vital for providing context and supporting those of us who don’t want to spend all our time reading. As we all know, learning is a journey; whether it is to get that new job, get a visa to a new country or to get into College or University, the learning doesn’t stop with the end of the course. A good online course should have progression built in – whether that is the next level higher or access to university or even options for employer placement. We know from experience that our partners love hearing from our recent graduates, so much so that we actually guarantee interviews for all of our graduating learners – and best of all, it’s a win win for everyone. These are the most important factors that we found when looking at online learning and e-learning courses. If you have more tips, tweet them to us at @beaconeducate and we will share them.